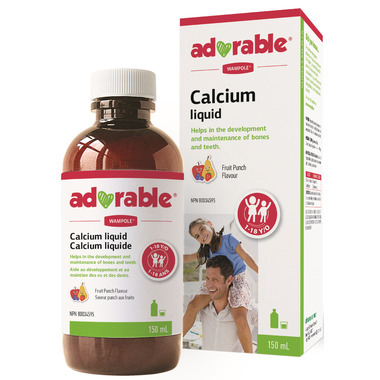 Wampole Adorable Calcium Liquid helps in the development and maintenance of bones and teeth especially in childhood, adolescence and young adulthood. A factor in the maintenance of good health. Directions: 1 to 18 years: 1 teaspoon (5 ml) 2-3 times per day. Shake well before use. Take a few hours before or aﬅer taking other medications. Can also be mixed with water or fruit juice. NON-MEDICINAL INGREDIENTS: dl-malic acid, fruit punch flavour, glycerin, potassium citrate, potassium sorbate, purified water, sodium benzoate.